In a small bowl, whisk together vinegar and 2 tablespoons of olive oil until dressing emulsified. Season with salt, pepper, and lime juice. Heat 1 tablespoon olive oil in a skillet over medium high heat. Add mushrooms and cook 3-4 minutes or until mushrooms release their water, add garlic and cook another minute. Remove from heat and toss with 3 tablespoons of the dressing.In a food processor, pulse the avocado and lemon juice until smooth.Using a cookie cutter, spoon about ¼ cup of avocado cream as a base, making a well in the center for the mushrooms. Place mushroom mixture inside of the avocado, and spread another tablespoon of avocado cream on top. 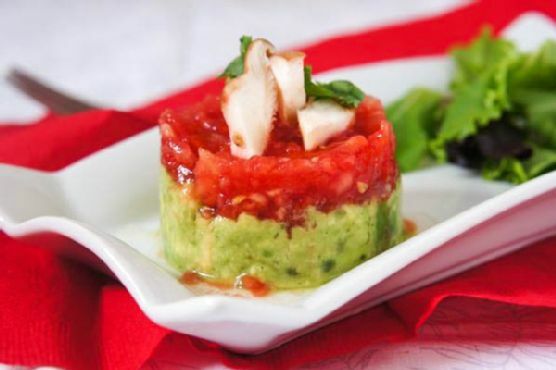 Spread ¼ of the tomatoes on top of the avocado and remove the cookie cutter gently.Repeat with remaining ingredients.